Rather that begin today the concentrated sequence of steel deliveries for the frame of the library's two more floors, the contractor for the project has decided to schedule just two deliveries for Thursday and Friday this week to lay down for temporary storage some initial pieces of steel on the construction site and then reschedule the longer period of deliveries uninterrupted after the study and exam period ends on May 10. The steel beams and other pieces for the frame will still arrive in sequence over a concentrated period lasting about eight weeks; this will just begin a of couple weeks later than initially planned. All deliveries are expected to come through the main construction zone gate next to the library building on Freret Street. 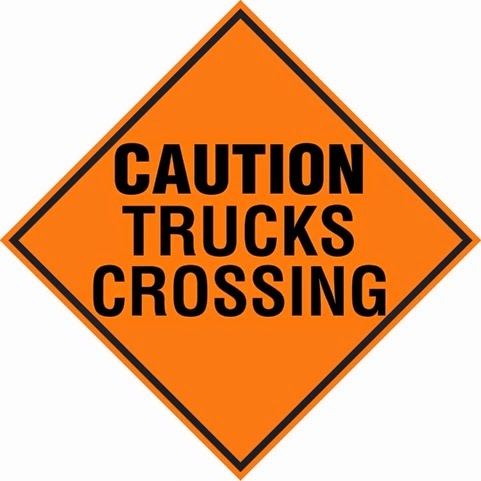 During the delivery period for the steel, large trucks can be expected to enter and exit the construction site from and onto Freret Street, during regular work hours six days a week (Mondays through Saturdays). Crews will direct both pedestrian and vehicle traffic around the gate as each truck arrives and exits. Much of the frame for the 5th and 6th floor building addition will be erected as the steel arrives. Steel for the frame of the library's two more floors is scheduled to begin to arrive on the construction site this Monday, April 21. The steel beams and other pieces for the frame will arrive in sequence over a concentrated period lasting about eight weeks. All deliveries are expected to come through the main construction zone gate next to the library building on Freret Street. During the delivery period for the steel, large trucks can be expected to enter and exit the construction site from and onto Freret Street anytime between 7 a.m. and 6 p.m., six days a week (Mondays through Saturdays). Crews will direct both pedestrian and vehicle traffic around the gate as each truck arrives and exits. The deliveries and work on the site generally will stop temporarily for the library's study and period of April 30 through May 10, and then resume immediately afterward. With this phased delivery of its pieces, much of the frame for the 5th and 6th floor building addition will be erected, using the large crane already onsite, as the steel arrives. Most of the ceiling work in the northeast corner of the 4th floor is nearing completion and the contractor for the construction project has now removed the plastic sheeting from about 3/4 of the book shelves in the 4th floor open stacks area. This uncovers books with call numbers BD241 through DAW1051. In this area only books with call numbers A through BD241 remain covered. Books still covered are on the shelving ranges closest to wall separating the open general stacks from the Latin American Library (LAL) closed stacks on the other side. User seating on the Dixon Hall side of the 4th floor open stacks area has been returned to use. Work in this area was to have been completed by March 28 and its scope has included the installation of fire suppression system pipe and heads, roof drain and plumbing connections, and related fixtures—all above the ceiling grid. 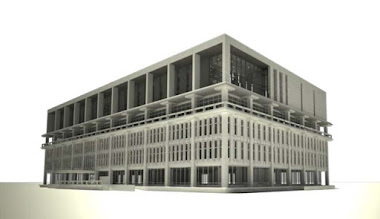 The work has taken longer than planned because the drawings based on original construction plans for the building have not proven to be an accurate guide in showing existing conditions such as the actual location of duct-work and other building features that conflict with the new construction plans. To minimize disruption the work has been prescheduled to progress in sequence by the dividing the 4th floor into five separate zones—a process that will eventually be replicated on the lower floors of the building, although with a reduced scope of work limited on the lower floors mainly to just the installation of the fire suppression system. Learning from problems uncovered in first zone on the 4th floor, a new series of sequenced work phases has been devised that calls for workers to first progress quickly through each zone (a few days in each) to simply remove all the ceiling tile on the entire floor. This will allow engineers to come in and produce “as built” drawings showing existing conditions of the entire floor and these will be used by the architects on the project to revise the new construction documents where necessary to avoid more delays as workers move through the 4th floor in scheduled phases. The new schedule of phases above shows adjusted dates for the periods during which the contractor plans to progress through the 4th floor with the primary ceiling work. The current problems have produced some overlap between work in separate zones, which was not originally envisioned. Specifically, pipe connections cannot be made above the open stacks shelves closest to the wall separating the area from the LAL closed stacks until the “as built” drawings are completed for the area on the other side of the wall. Therefore crews proceeded directly to that area on April 1, earlier than planned, to remove the ceiling tiles and begin their reconnaissance there, and problems are slowing being resolved. 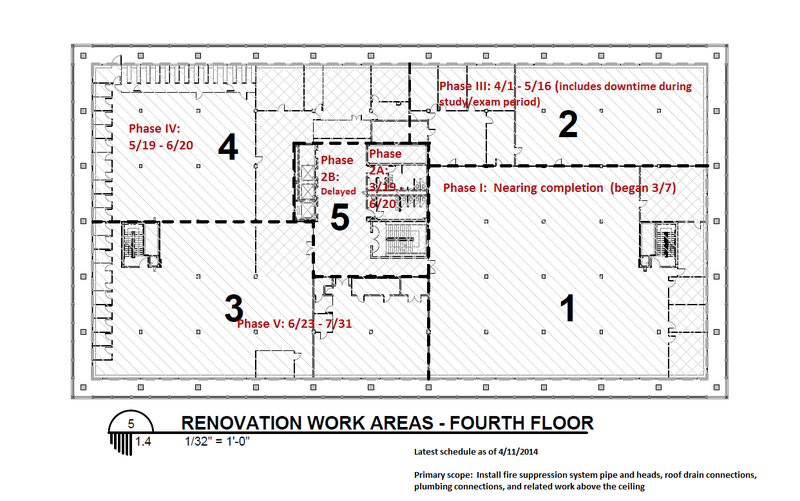 Crews have completed the shear wall between the central stairwell and the women’s restrooms on the 3rd and 4th floors, and are now engaged in putting those restrooms back together. Those restrooms have been scheduled to reopen next week, although the work may be at least a few days behind. Crews are still just in the early stages of constructing the shear wall nearby between the men's restrooms and the central chase on the 3rd and 4th floors. Jack-hammering around the perimeter of the rooftop has been mostly completed. However, loud noise from drilling and occasional jack-hammering can be expected periodically over the next couple of months on the roof as crews remove in phases portions of the building presently surrounding the elevator mechanical system. Crews are also continuing to install anchor bolts and other fittings in preparation for the steel frame. The steel for the frame of the 5th and 6th floors is now scheduled to begin to arrive on site on April 21. Delivery and framing of the steel is set to take place in a carefully phased, concentrated 8-week sequence. Meanwhile, in recovering from February's roof leak, the 2,200 wet books sent to Texas for restoration have been returned. They were shipped to the library's Recovery Center at 900 S. Jeff Davis Parkway. LAC Group staff at the Recovery Center will begin processing the returned books next week so we can quickly get them back on the shelves.